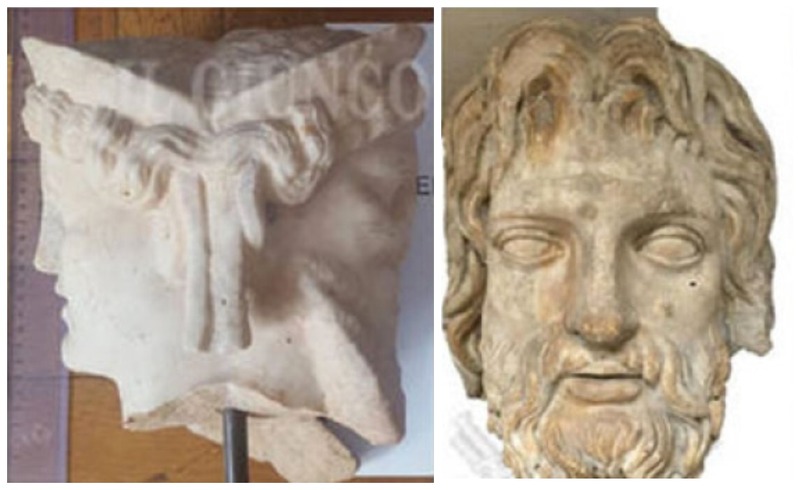 Four antiquities collectors in Grosseto stand accused of illicit detention and possession of property belonging to the state after officers from Italy's Guardia di Finanza seized more than 200 undocumented ancient objects uncovered during asset controls in the garden of a villa. 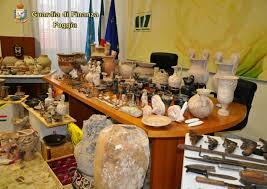 The search and seizure warrant was issued by the Public Prosecutor of Rome. Some of the pieces recovered date back to the Roman imperial age and depict various inscriptions and scenes of Mithraism. 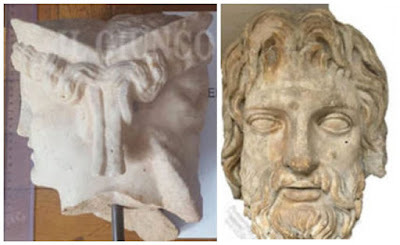 In addition to these, law enforcement officers seized marble heads and busts, including the one of Jupiter pictured in the header of this article, and another of Faustina Maggiore. Also seized was an ancient sarcophagus, unfortunately converted into a utilitarian planter, a full-body statue of a female, attic pottery, columns, and pedestals. Many are in poor condition, perhaps due to exposure to the elements. 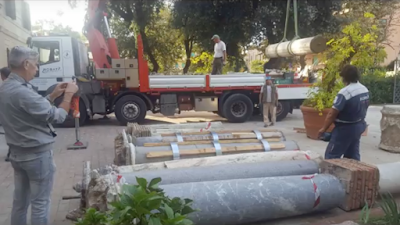 As part of this investigation, Italy's finance police raided 22 residences in three regions: Lazio, Sicily, and Tuscany. 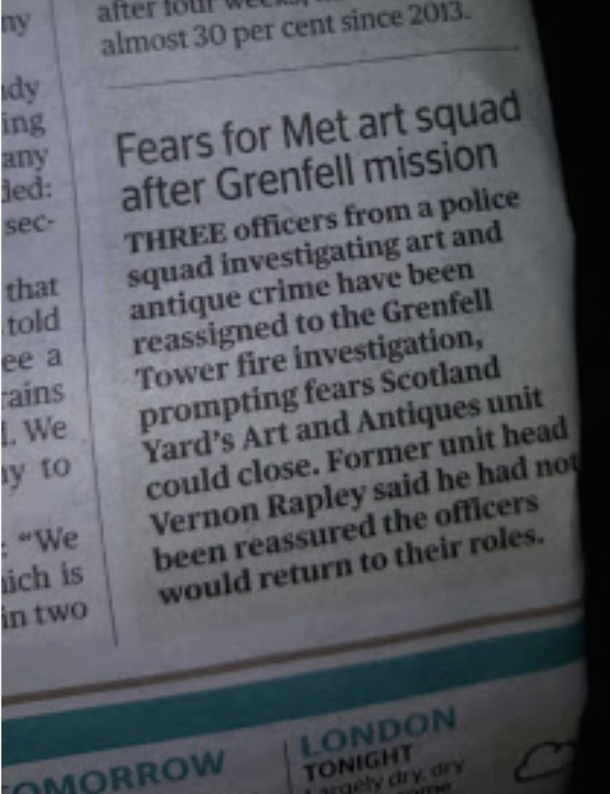 Eleven suspects have been placed under investigation. Rome: A lab which will help the force to detect and unmask fakes and forgeries. Given the growing phenomenon in counterfeit cultural heritage, Italy's Comando Carabinieri Tutela Patrimonio Culturale and Rome's Roma Tre University have signed a Memorandum of Understanding for the establishment a “Laboratorio del Falso,” a lab which will help the force to detect and unmask fakes and forgeries and aimed at teaching and scientific research related to cultural heritage. 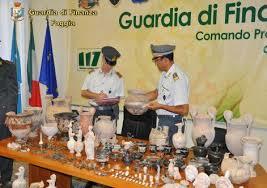 In 2017 the Carabinieri seized, 783 fake objects compared to only 57 fabrications in 2016. 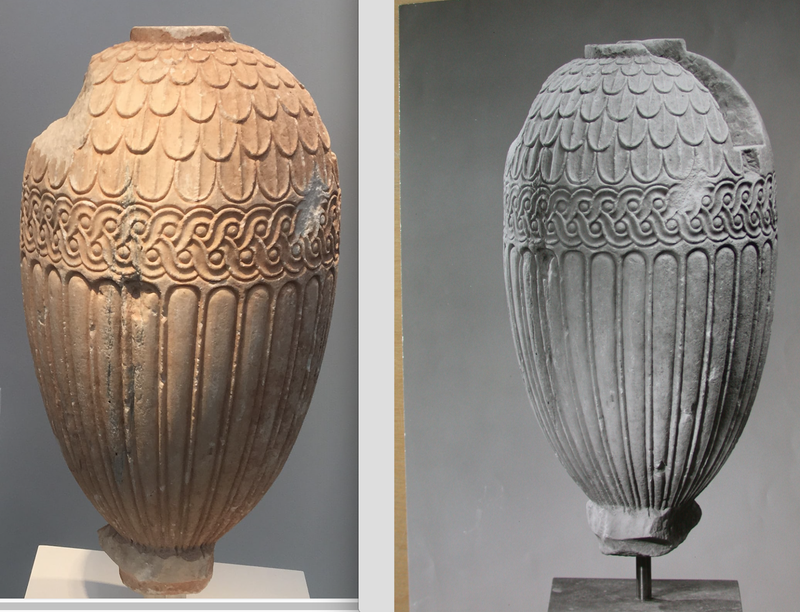 As ever-more-elaborate forgeries hit the market, more research is needed to differentiate between what is genuine and what is counterfeit. 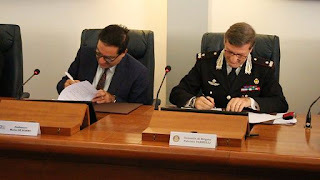 Signed by Brigadier General Fabrizio Parrulli, Commander of the Carabinieri for the Protection of the World Cultural and Prof. Mario De Nonno, Director of the Department of Humanities of the University of Roma Tre the goal of the agreement and the laboratory's development is to help enhance scholarly insight and in so doing, work to alleviate the proliferation of inauthentic works in the art market. 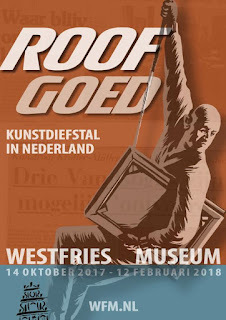 Motivated by the ease with which historical and visual evidence is manipulated by con artists preying on collectors, the adopted partnership will carry out studies on the artists most prone to counterfeiting and will examine and develop techniques, procedures, and systems to allow better identification of the genuine thereby helping to shine the spotlight on what is real, rather than what is a deception. In conjunction with this initiative Italy's MiBact and the Ministry of Economic Development will present 15 lectures in different Italian cities on the problem and recognition of art forgeries, titled "L'arte non vera non può essere arte" (Art that is not authentic, isn't art". The events will be held in the cities where the Carabinieri TPC have their regional offices and will conclude with a special event at the Galleria Nazionale d'Arte Moderna, (National Gallery of Modern Art --GNAM where there will be an exhibition of copies of counterfeit works of art previously confiscated by law enforcement agencies throughout the country. 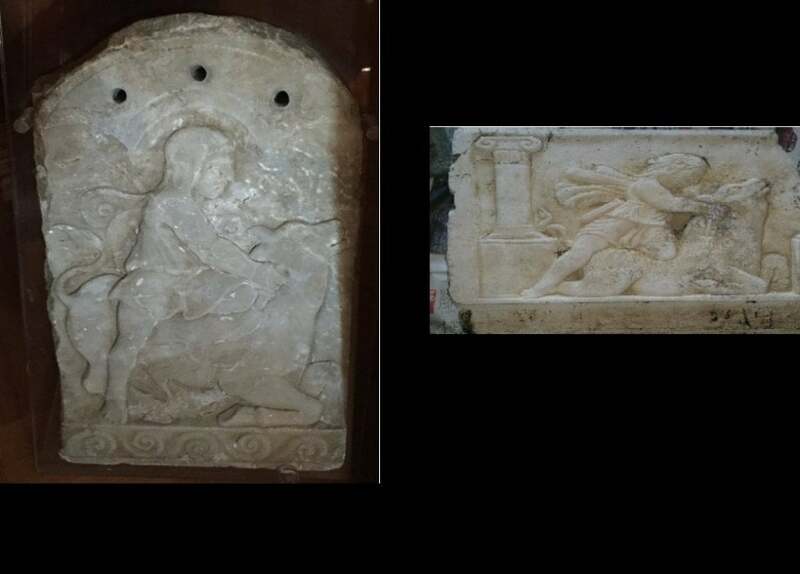 Universita' degli Studi Ca’ Foscari - "Mario Baratto Conference Hall"
UPDATE: The two Philaeni bronzes in Libya are reported as safe. 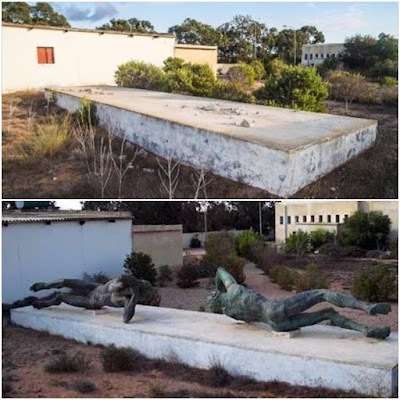 Earlier today, alerted by news reports from Libyan environmental activist Saleh Drayagh, ARCA posted a blog report that two reclining bronze statues of the Philaeni brothers had been stolen from an archaeological site in Sultan, Libya, 60 km east of Sirte by factions loyal to the Islamic State group. The bronzes were all that was left of the 100 foot tall, Marble Arch, also known as the Arch of the Philaeni (Italian: Arco dei Fileni), which was erected during the period of the Italian occupation and officially unveiled by Mussolini in 1937. 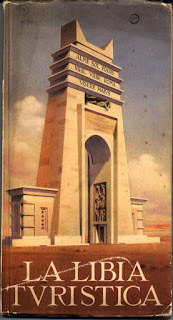 During that time, occupying forces built the Via Litoranea, the first tarmac road around the Gulf of Sidra, and constructed the rather out of place monumental arch at the point which marked the border between the two provinces of Tripolitania and Cyrenaica at Ras Lanuf and Al Uqaylah. While the arch survived the Second World War it was later blown up under the orders of Muammar Gaddafi in 1970. Gaddafi, the deposed leader of Libya, was captured and himself killed on 20 October 2011 during the Battle of Sirte. When first erected, the arch paid tribute to a story from long ago, when Libya was divided by still another war, the fight between the Carthaginian in the West and the Greek Cyrenaica in the East. Legend had it that the two nations agreed to define their border with an unusual method. Each opposing force is said to have treated by selecting runners who were to start out running towards one another at the same time on the same day. 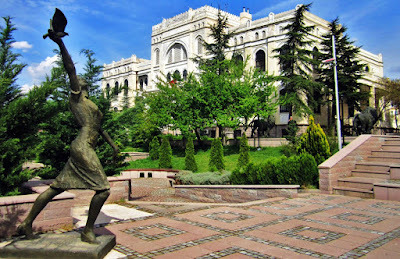 When the runners converged, the spot would then mark the border between the two opposing nations. Carthage chose the two Philaeni brothers, who it is said proved faster than the squad from Cyrene. Arriving ahead of their adversaries, rumors began floating about that the Carthaginians had cheated by allowing their runners to start earlier than the prescribed time. 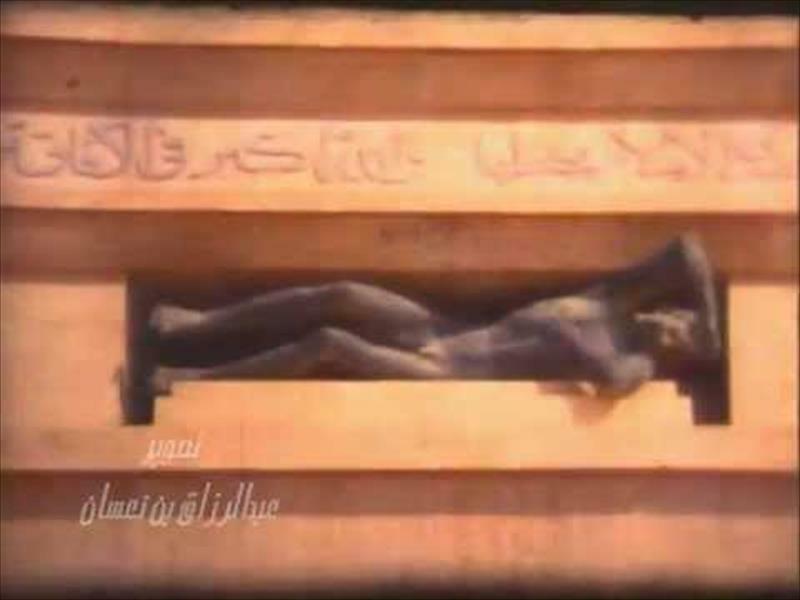 As a result, the Cyrenaica refused to accept the results and honor the deal. Seizing the runners, the two Philaeni brothers were given a difficult choice, most likely to provoke a confession for duplicity. The pair could either agree to be buried alive, right there on the spot and marking the new border with their tombs, or they could allow the Cyrenaica to continue to advance at their convenience to the west. The brothers patriotically accepted the first option and the Carthaginians built two commemorative altars at their gravesite to honor their sacrifice. 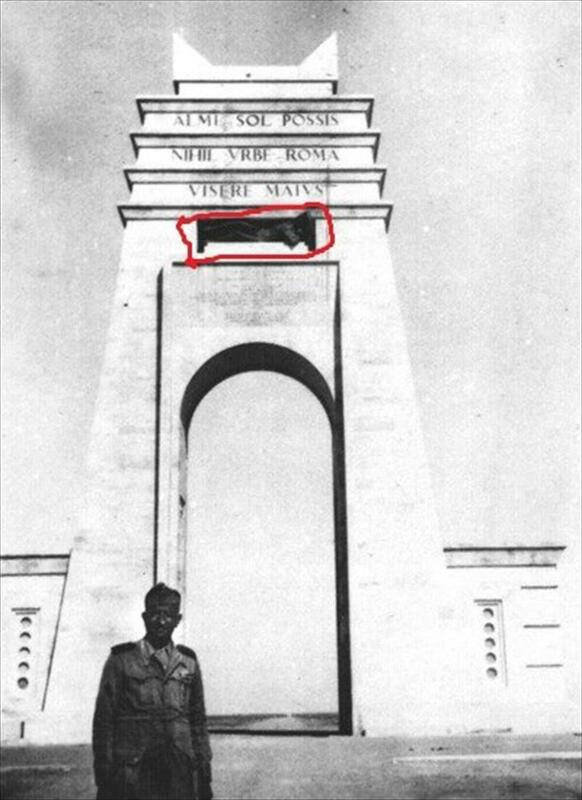 On the ruins of the altars Mussolini's forces later erected the marble arch. But as more and more corpses pile up in Libya's modern war, specifically in the battle in Sirte against the Islamic State, the bronze bodies of corpses have luckily not become a casualty. Instead, they have been dismounted and moved to a safe place. 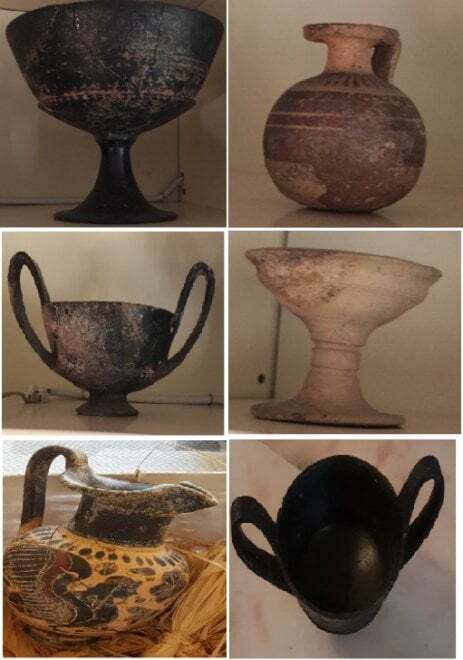 According to a statement issued by the director of Sirte Office of Antiquities, Abdel-Azim Hafez, all the artifacts are in safe hands and with the full knowledge of the Libyan Antiquities Authority and UNESCO for fear of theft and sabotage due to the current situation in the country. the case involving plaintiffs William and Lynda Beierwaltes and a Marble Head of a Bull (ca 500-460 BCE) filed with the United States District Court for the Southern District of New York has been voluntarily dismissed with prejudice. Copies of the public domain records on this case, including this Notice of Voluntary Dismissal written on October 11, 2017, can be found in the case review files on ARCA's website here. Thirteen Roman-era marble columns, two pedestals, a funerary stele, architectural capitals, amphorae and vases have reportedly been recovered by Italian authorities from INSIDE a private residence in the Santa Teresa area of Anzio, approximately 50 km from Rome. Given their large size, many of the objects have been temporarily transported to the Museum Villa Adele at Anzio where the larger of them remain outside the museum near its entrance. 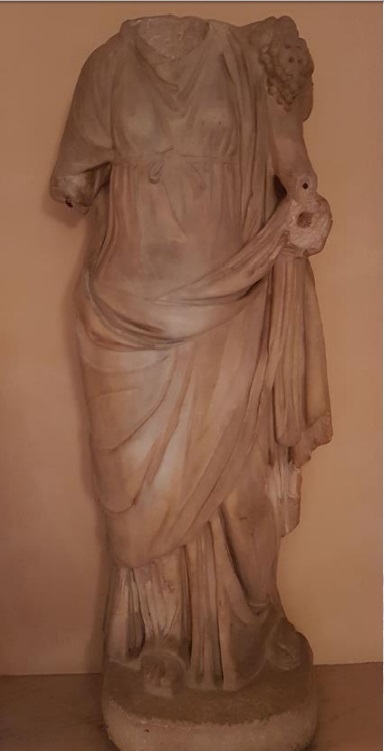 No indications, in initial public reports, state when this seizure occurred or in whose private villa the ancient objects were initially sequestered. 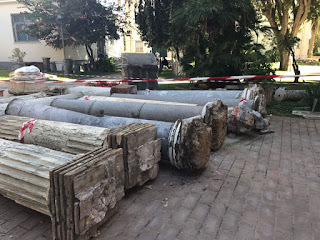 The large size of the artifacts, which required heavy transport vehicles to deposit them at the entrance of the museum, leave more questions unanswered than answered. 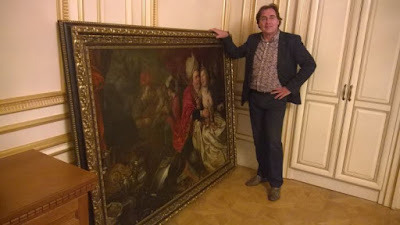 how could objects this large be stolen and transported inside a private home without raising any alarm bells along the way? 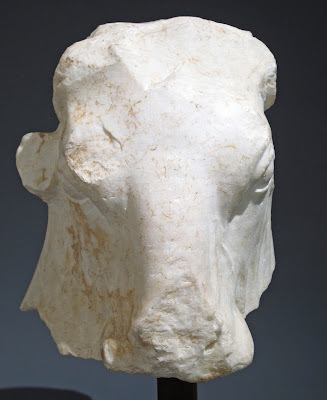 On Wednesday, through lawyer, William G. Pearlstein, collectors William and Lynda Beierwaltes released a formal statement on the Marble Head of a Bull (ca 500-460 BCE) seized by the New York District Attorney’s office on July 06, 2017 while on loan at the Metropolitan Museum of Art over suspicions that the antiquity had been pillaged from Lebanon during that country's civil war. The bull's head sculpture was acquired by the couple on November 27, 1996 for US$1.2 million from one of the (now) most notorious dealers in the antiquities world, Robin Symes. 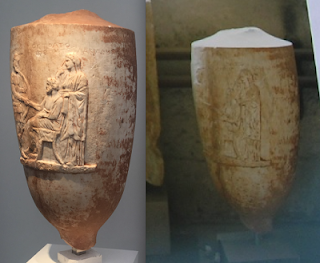 This decision was taken after the State of New York's 68-page Application for Turnover went into painstaking detail on how this plundered antiquity made its way illicitly to the United States. 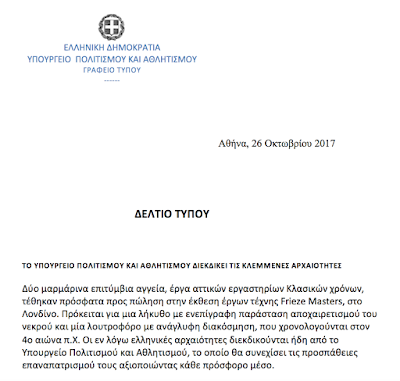 That document can be read here. 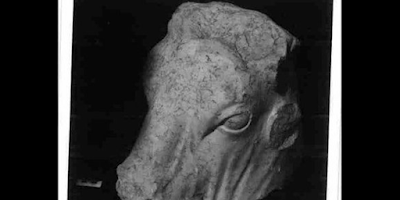 In a letter to the Honorable Daniel P. FitzGerald with the Supreme Court of New York County, Assistant District Attorney Matthew Bogdanos writes that the Beierwaltes have signed a stipulation consenting to the Court’s release of the Bull’s Head to the Lebanese Republic pursuant to N.Y. 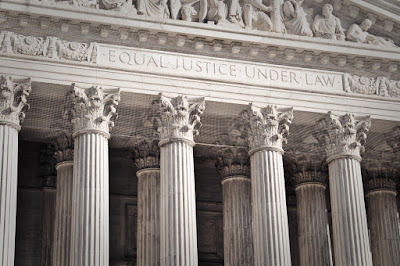 Penal Law §450.10 on the disposal of stolen property and the N.Y. Criminal Procedure Law §690.55 on search warrants and the disposition of seized property. 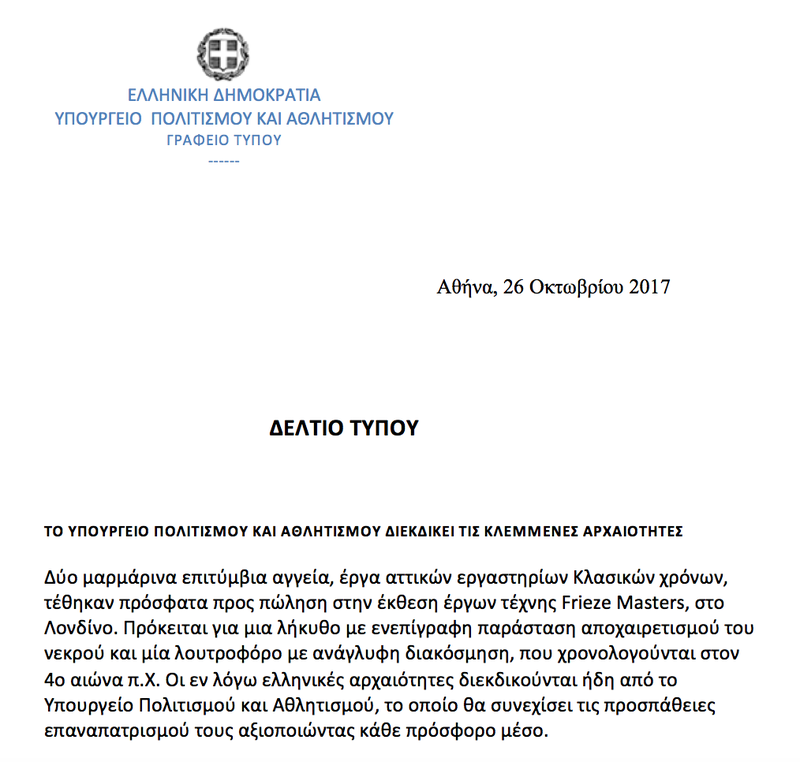 A copy of this letter can be read here. 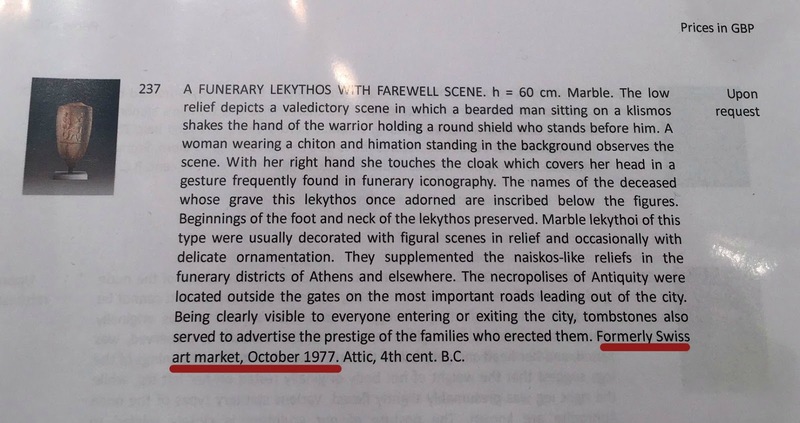 This voluntary forfeiture paves the way for a formal ceremony of repatriation, in which the Bull's Head will be handed to a representative to be designated by the Lebanese Ministry of Culture within 15 days. According to a New York Times article, Assistant District Attorney Matthew Bogdanos and researchers which have supported his case spotted another potentially looted antiquity, also from Lebanon. 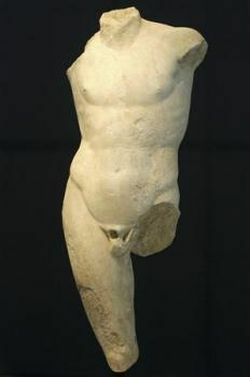 This object, a marble torso of a calf bearer, was identified in a photograph taken inside the Beierwalteses’ home for the June 1998 special issue of of House & Garden magazine. The photos for this magazine are included in publicly filed documents with the New York District Attorney case and can be read here. According to an article by Colin Moynihan for the New York Times, Attorney Bogdanos has stated that this object too may have been plundered from Lebanon prior to it being acquired by William and Lynda Beierwaltes. 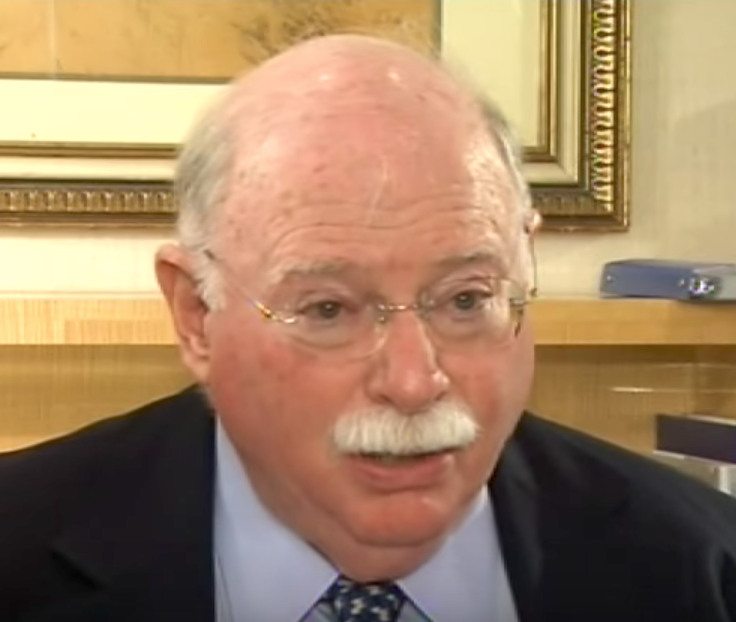 The article goes on to specify that the Beierwalteses then sold this object on to New York collector Michael H. Steinhardt, in 2015. 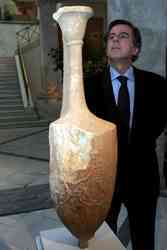 The DA's office has stated it has obtained a warrant to seize this object from Mr. Steinhardt. 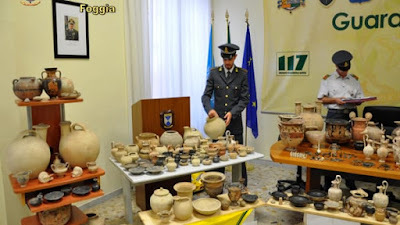 Today, Italy’s Guardia di Finanza unit in Foggia announced the recovery of a large stash of antiquities, antique weaponry and religious art and relics. In two separate raids between Cerignola and the provincial capital of Foggia GdF officers have recovered 350 archaeological objects including votive statues, two volute craters decorated with moulded Medusa head handles, an impressive quantity of gnathia vases, attic pottery, painted plates, pouring vessels, and ancient jewelry decorated with gold, stone and bronze elements. 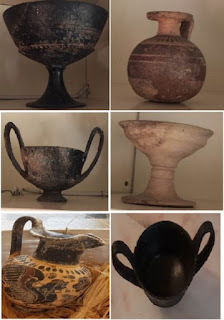 According to the superintendence who evaluated the finds, some of the ancient objects likely plundered from a Roman or Samnite tomb, possibly that of a soldier. 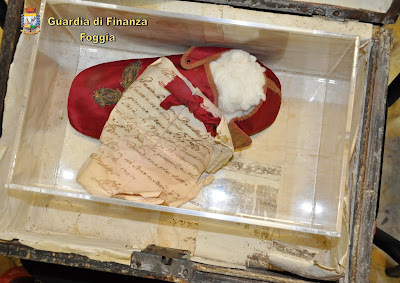 In addition to the antiquities officers recovered a canvas painting taken a few years back from the rural church of Palazzo d'Ascoli in the countryside of Ascoli Satriano, in the province of Foggia and what appears to be slipper, attached with a note proclaiming it belonged to the Blessed Pope Innocent XI (1611-1689). 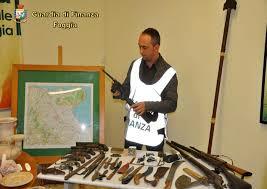 Also recovered were a group of antique firearms dating back to 1600 -1800, as well as modern weaponry. 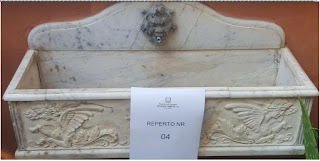 Two individuals, a 48-year old from Orta Nova and a 61 year old from Cerignola have been taken into custody by the financial police of the provincial command of Foggia charged with illegal possession of weapons, stolen goods and violations of the rules on the protection of cultural heritage. The latter individual, an attorney, has been released for the present time. 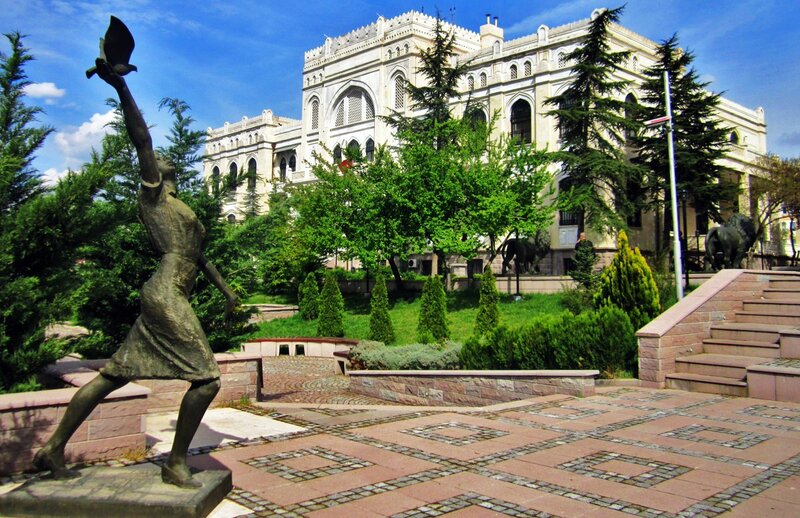 In August 2012 Hurriyet Daily News highlighted a report produced by Turkey's Culture and Tourism Ministry that examined more than 5,000 artworks in the country's State Art and Sculpture Museum in Ankara. 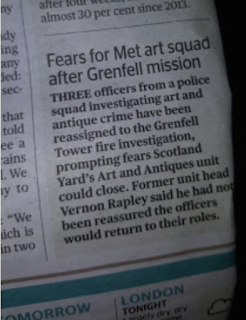 In that report, the ministry identified that it was unable to account for more than 200 artworks from the museum and that several of the pieces apparently missing had subsequently been replaced with poor quality reproductions to disguise their removal. Some of the works stolen included artwork by highly valued Turkish artists such as Şevket Dağ, Şefik Bursalu, Zühtü Müridoğlu, Hikmet Ona, and "Hoca" Ali Rıza. 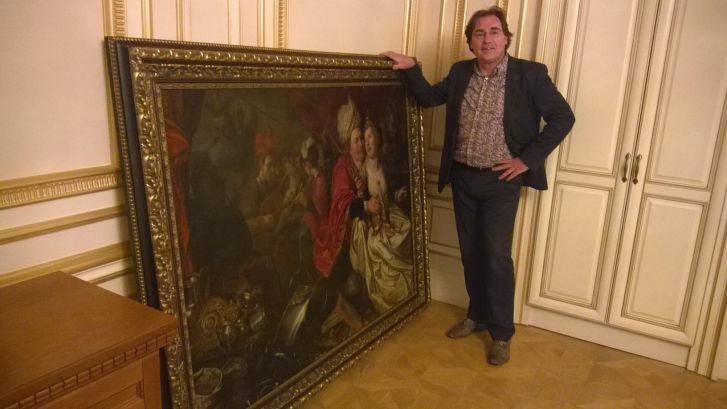 When the news of the theft went public, experts and common citizens alike complained that the museum, like many in many countries, did not have an adequate inventory system in place to track and account for artworks moving in and out of the museum and the museum's storage areas. This vulnerability, it was partially reasoned, worked in the thieves favor. A subsequent investigation into the scandal brought 18 individuals in for questioning and three individuals were formally charged and sentenced to prison for their involvement in the affair. Cross checks conducted during this investigation revealed that some of the artwork originally listed as missing had instead been loaned out by the museum to government officials to decorate various governmental ministries and unauthorized buildings without proper documentation to account for their transfer. Adjusting the loss number for artworks later identified off-site, the total number of objects was reduced to 180, and until this week, only sixty-four have been recovered. 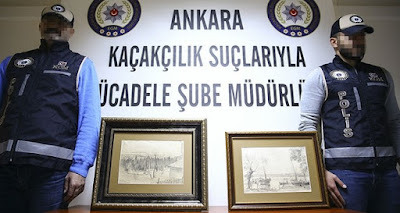 Yesterday, two drawings by Turkish painter and art teacher "Hoca" Ali Rıza, were seized by Turkish security forces from an art gallery in Istanbul with one individual being taken into custody for questioning. 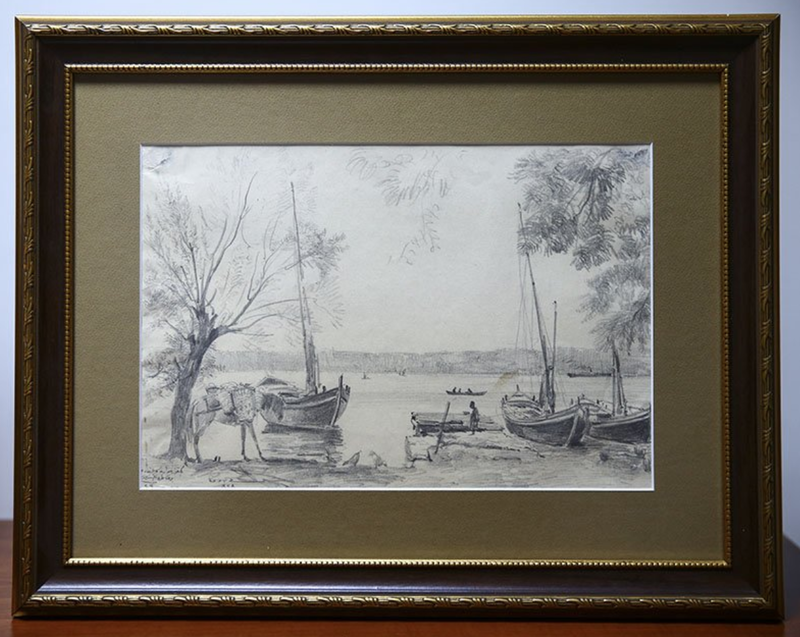 A artist from the late Ottoman era, Riza is primarily known for his Impressionist landscapes which captured Turkish neighborhoods and architectural elements. 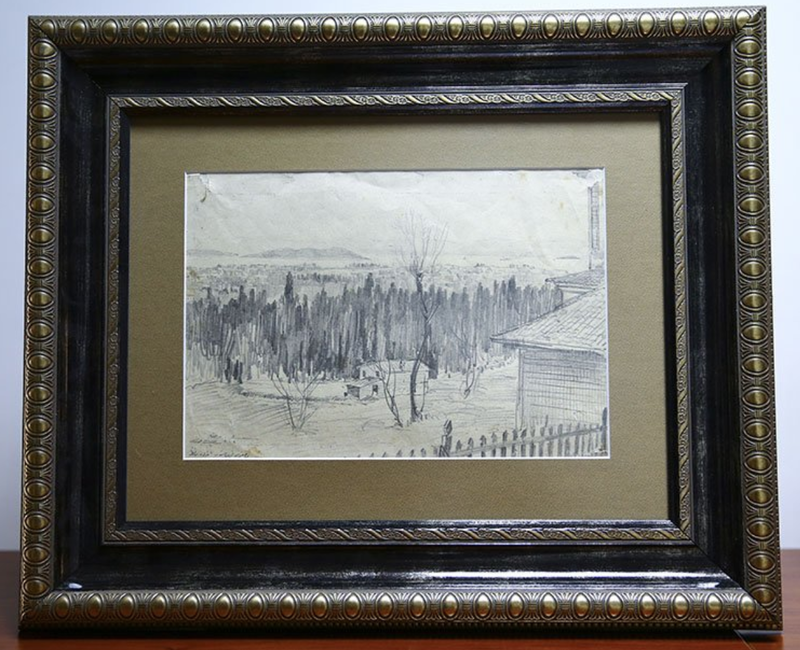 13 of his sketches are known to have been stolen and exchanged with forged replicas. 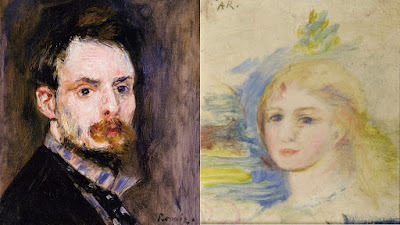 Theft: Pierre-Auguste Renoir "Portrait d'une Jeune Fille Blonde"
Image Right: Stolen "Portrait d'une jeune fille blonde"
Identifying items: AR initials in the top left of the painting. 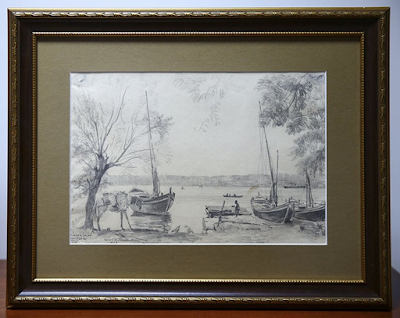 Frame labeling: Chaussegros (Vichy), and a canvas numbering "022"
The painting was taken, unnoticed, from the wall of a gallery the Parisian auction l'Hôtel des Ventes de Saint-Germain-en-Laye (Yvelines) operated by SGL Enchères/F. 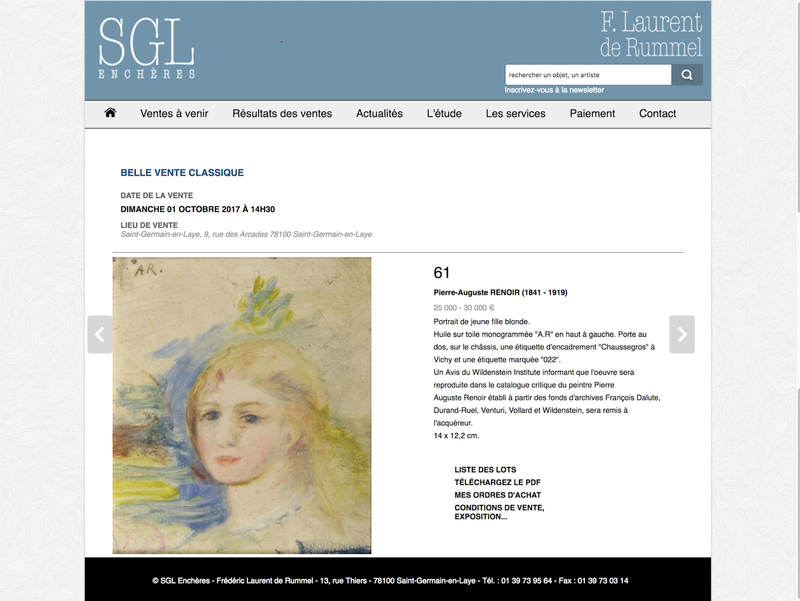 Laurent de Rummel where the artwork had been on display just prior to its auction. 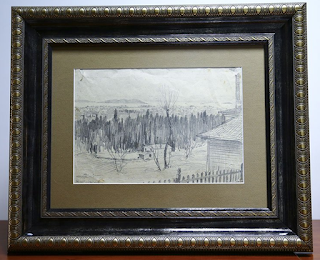 The thief purportedly unhooked the painting and left the premises without being seen. 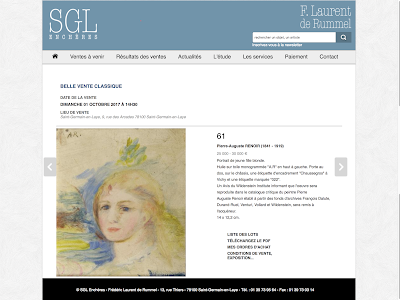 Value details can be seen in the screen capture from the auctioneers website above.